Kratos sure as heck didn’t get his bod by just sitting around in the wooden house he and Fey built, and even though his body-building skills might remain a mystery to those of us who don’t have demi-god blood running through our veins, don’t worry. Men’s Health Singapore has an issue dedicated to how to get the Ghost of Sparta’s muscled body. Spotted by Reddit user niohdaily, The God of War himself appears on the front cover, which promises to show you how to build the ‘ultimate dad bod’. While I wouldn’t say that Kratos’ body is typical of dads across the world, I sure as Helheim would like to know the mysterious magic that went on behind-the-scenes of Men’s Health to try and figure out how exactly one gets Kratos’ body. And no, not in a weird necromancy sense. Those of you reading this with an ounce of common sense might just think that the regime includes bench presses, weight-lifting and the like, but part of my brain is trying to convince me that there’s the odd mention of being blessed/cursed by the gods, drinking a mystic concoction, and probably having to massacre a real-life deity to truly achieve Kratos’ ripped body. Don’t try to tell me otherwise (because I won’t listen). 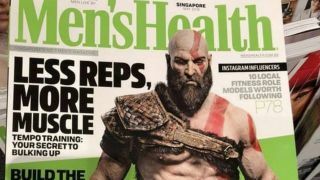 The rest of the issue is dedicated to how to build the body of fantasy heroes, so clearly Kratos is not alone in being featured in Men’s Health Singapore. Then again there’s also a section on more… raunchy section, which I really, really hope other fantasy heroes aren’t featured in. Fan fiction covers plenty of those bases, let me tell you. If you’re after more God of War goodness, here’s all the hidden God of War Easter eggs we spotted in the game, or look below to see what we thought of it!